An anti-Russian satirical map produced by a Japanese student at Keio University during the Russo-Japanese War. It follows the design used by the Englishman Frederick Rose (cited in the text as "a certain prominant Englishman") for a similar map first published in 1877, ID #2275. Harwood 2006, 128. The Russian octopus's tentacles are everywhere, grasping at Finland, Poland, the Balkans, "Cremia" (plus ca change), Turkey, Persia, and Tibet. Most importantly here, a tentacle reaches across Manchuria to Korea and Port Arthur. The map is dated March 1904, after the successful Japanese surprise attack on Port Arthur, but while the fighting was continuing. See generally Curtis 2016, 8-11; Baynton-Williams 2015, 196; Harmon 2004, 116-17. "'Black Octopus' is a name newly given to Russia by a certain prominent Englishman. For the black octopus is so avaricious, that he stretches out his eight arms in all directions, and seizes up every thing that comes within his reach. But as it sometimes happens he gets wounded seriously even by a small fish, owing to his too much covetousness. Indeed, a Japanese proverb says: 'Great avarice is like unselfishness.' We Japanese need not to say much on the cause of the present war. Suffice it to say that the further existence of the Black Octopus will depend entirely upon how he comes out of this war. The Japanese fleet has already practically annihilated Russia's naval powers in the Orient. The Japanese army is about to win a signal victory over Russia in Corea and Manchuria. And when ... St. Petersburg? Wait & see! The ugly Black Octopus! Hurrah! Hurrah! for Japan. - Kisaburo Ohara, March 1904." The octopus is a persistent trope in persuasive cartography. It first appeared in Frederick Rose's "Serio-Comic War Map For The Year 1877," ID #2272, about the Russo-Turkish War. "Once Fred W. Rose had created the 'Octopus' map of Europe, it proved difficult to rid propaganda maps of them." Barber 2010, 164. "The prevalence of the octopus motif in later maps suggests that the octopus also spoke to humanity's primeval fears, evoking a terrifying and mysterious creature from the depths (the dark outer places of the world) that convincingly conjured a sense of limitless evil." Baynton-Williams 2015, 180. 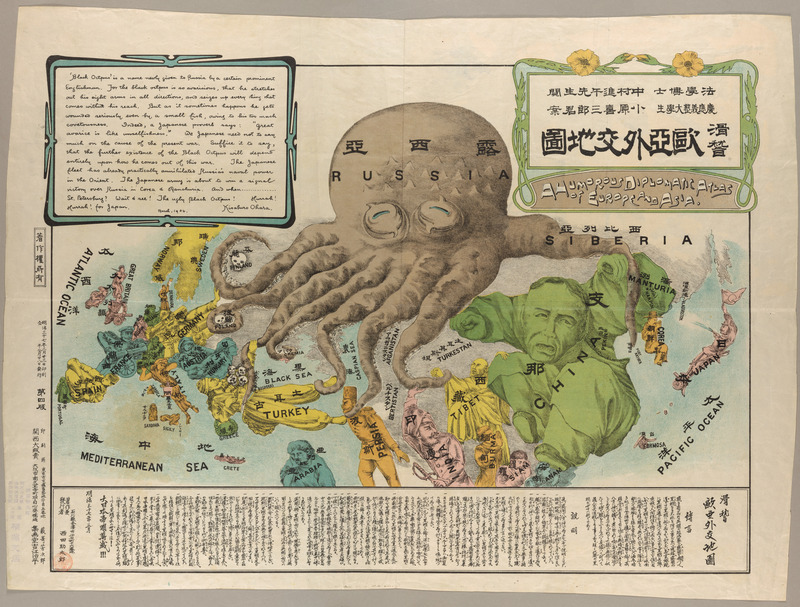 The octopus has frequently appeared in satirical maps of territorial expansion and war, including the Russo-Japanese War of 1904 (ID #1145), British imperialism in the North Indian Ocean (ID #2149), World War I (ID ##1185, 2286), World War II (ID ## 1318, 2123, 2169) and the Cold War (ID #1388). It's also been used on maps attacking a wide range of intended social and political targets, including a "reactionary" journalist (ID #1253), the Standard Oil Monopoly (ID #2140), “Landlordism” (ID #2285), and world Jewry (ID #2111). These works show the use of the octopus by mapmakers from Britain, France, Germany, Japan, the Netherlands and the U.S.